I met Hugo Cardoso in 2008 through a popular Argentinean TV program (a sort of reality show) in Buenos Aires, Argentina, promoted by a leading physician in slimming treatments and obesity. 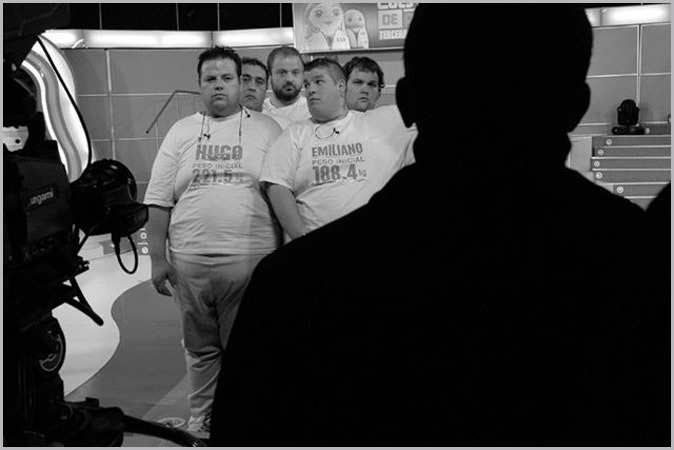 Hugo, currently 41 years old, tipped the scales at approximately 250 kilos when he went to the program's casting session, seeking help to deal with his weight problem. The problem involved having to live with another ten people with the same problem for 6 out of 7 days a week in a house near the clinic. Sometimes he did not go home the whole week. For nearly a year, he was given various treatments there and participated in the TV program as the directors required. 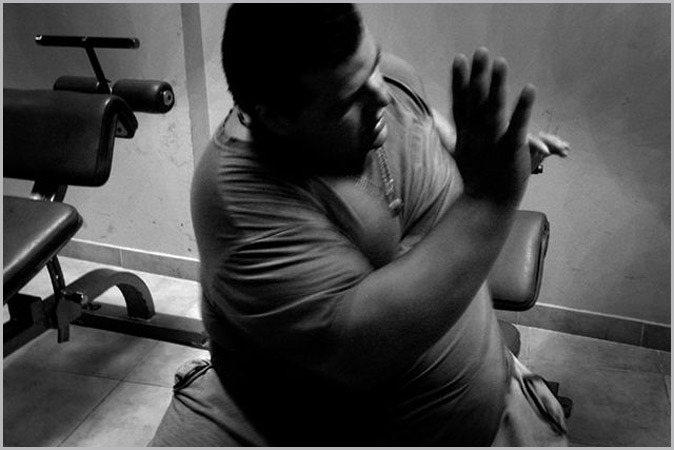 He lost 100 kilos in 12 months. Then, weighing 150 kilos and with dozens of problems, including financial ones, he was ready to go ahead and try bariatric surgery or a gastric bypass and drop his weight to 135 kilos. This is the chronicle of his time in the midst of his intense struggle, when he was trying to reverse the course of a crisis that began with the death of his mother, when he was newly married, an enterprising worker and self-employed, 1.85 m tall and the perfect weight. 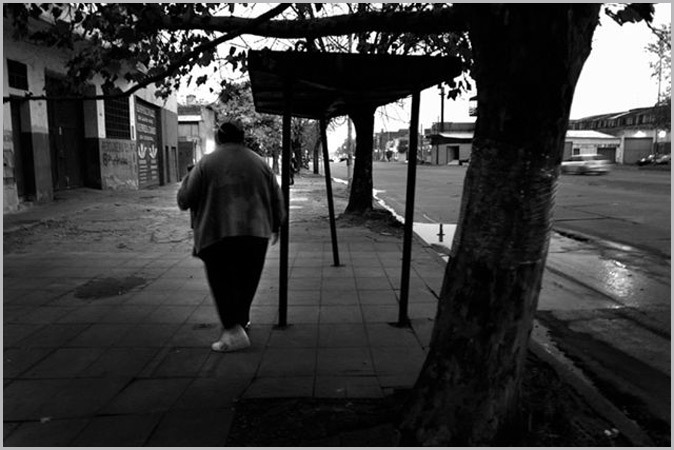 1/22 | Hugo strolling along the streets of his neighborhood in Villa Soldati, Buenos Aires. 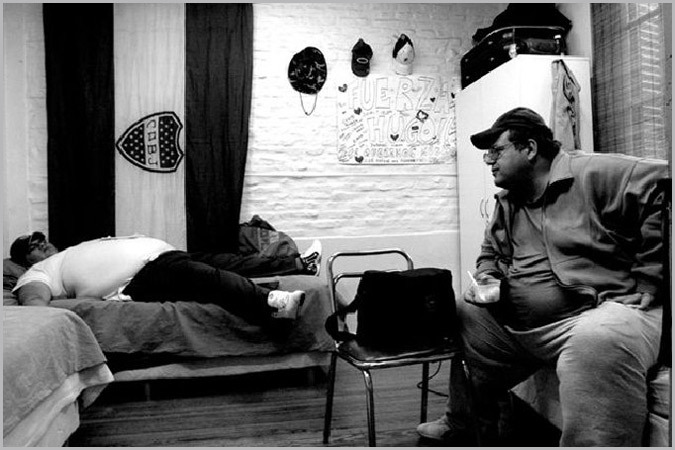 2/22 | With one of his fellow housemates inside their bedroom in the Community House provided by the TV program for their patients. 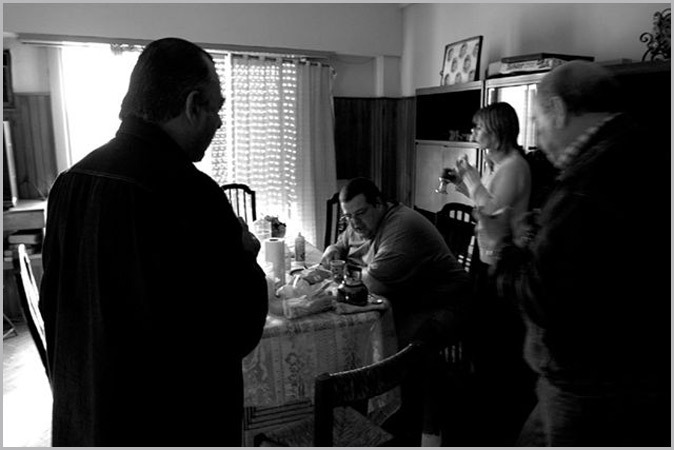 3/22 | During the weekends Hugo shares breakfast with his family. 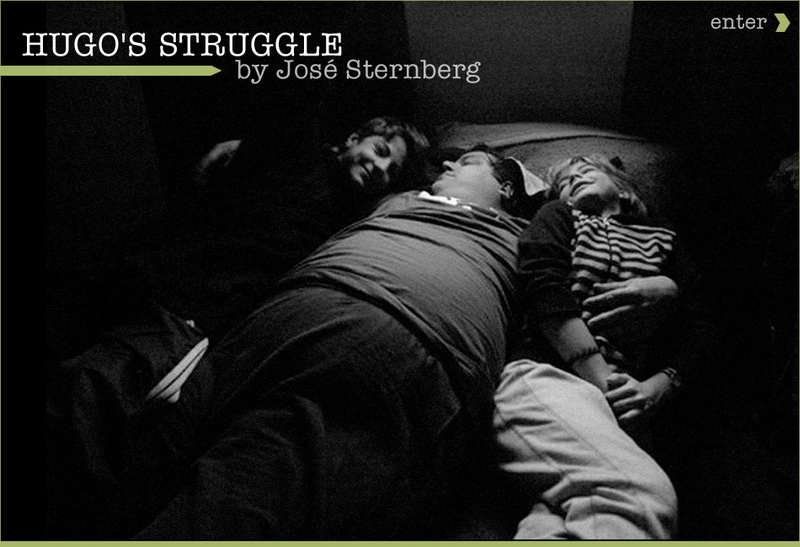 4/22 | Obesity carries numerous health problems for Hugo, among them cardiac issues, which he has to check continuously. 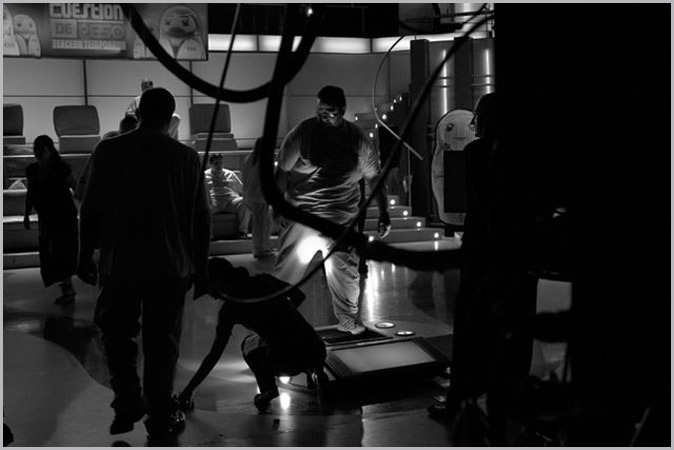 5/22 | Patients weight is checked daily for the TV show. 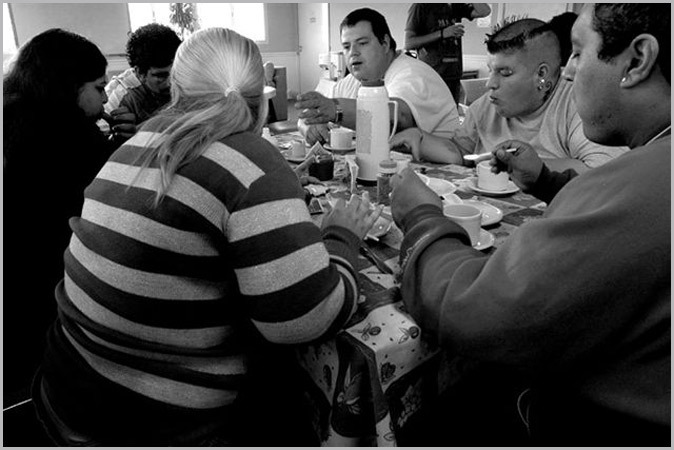 Hugo’s weight has to be continuously lower, otherwise he may lose the right to stay at the Community House. 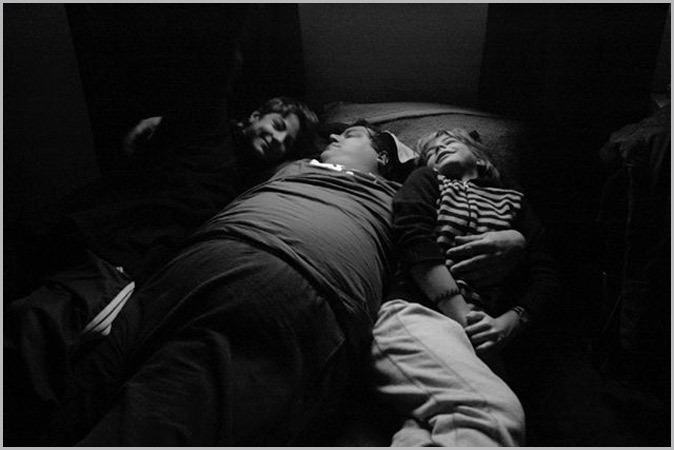 6/22 | During the weekends Hugo spends time hugging and expressing love to his children. 7/22 | At his work instructing his workers. 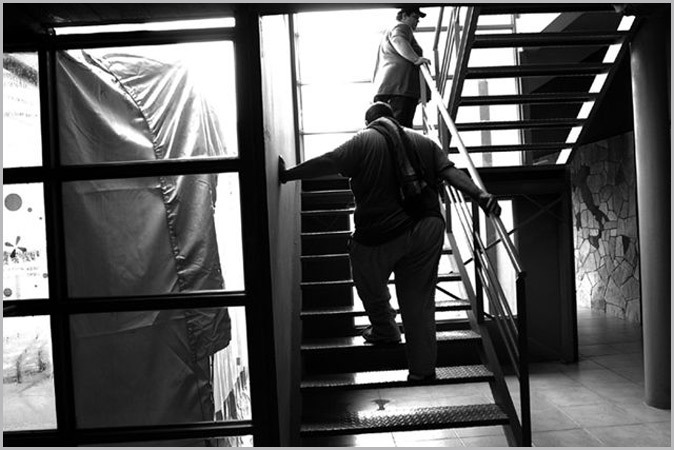 8/22 | Physical training is of most importance for his health. 9/22 | Playing at home with his son "Huguito". 10/22 | After training, Hugo goes upstairs to take a shower and change his clothes. 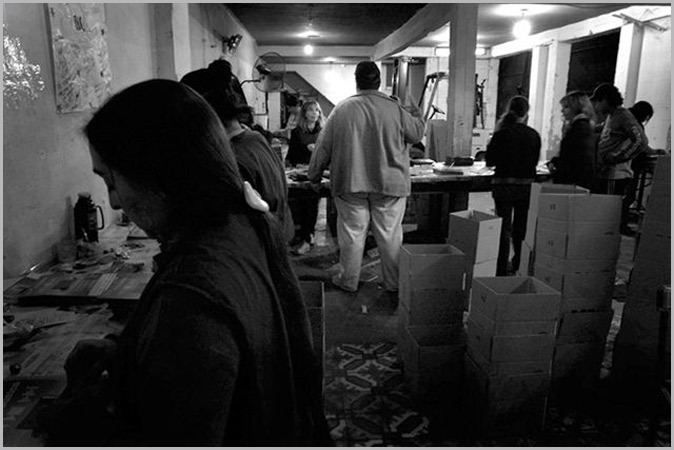 11/22 | Hugo is a passionate believer in God and observant of the Christian Evangelical religion. 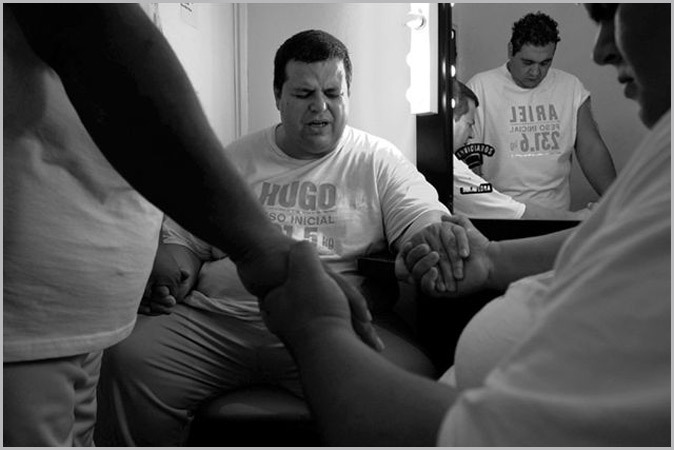 In the image he prays with his fellow housemates before entering the TV set where they will be weighed. 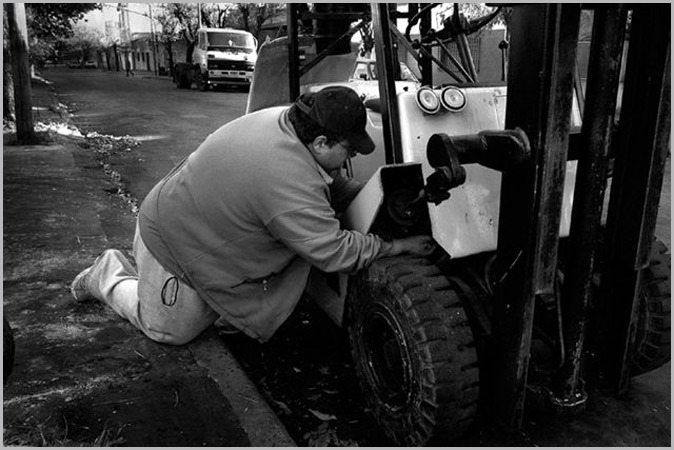 12/22 | Sunday afternoons he gets ready to return to the community to resume his treatment. 13/22 | Machines are Hugo’s passion. He spends free time repairing an old mechanic machine. 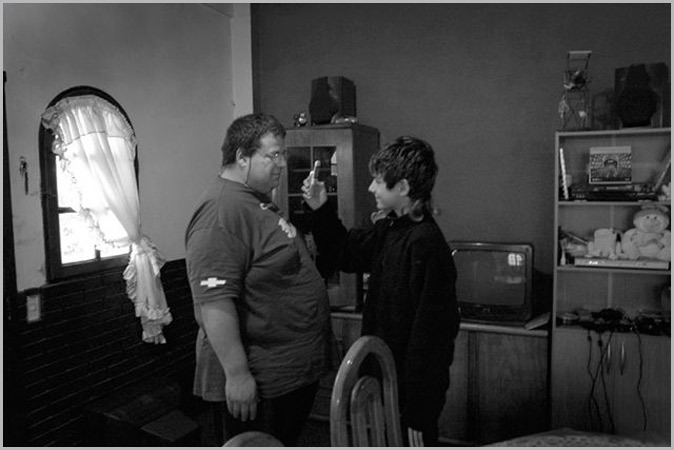 14/22 | His wife Roxana loves Hugo and assists him in whatever he may need. 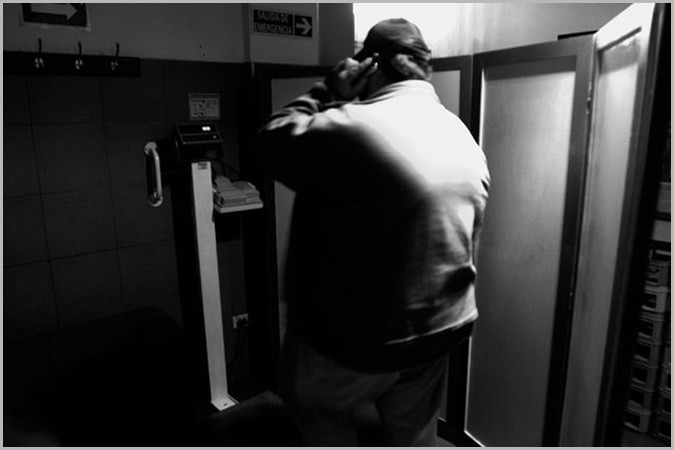 15/22 | On the phone with his wife Roxana, excitedly reporting his last weight before going to the TV Show. 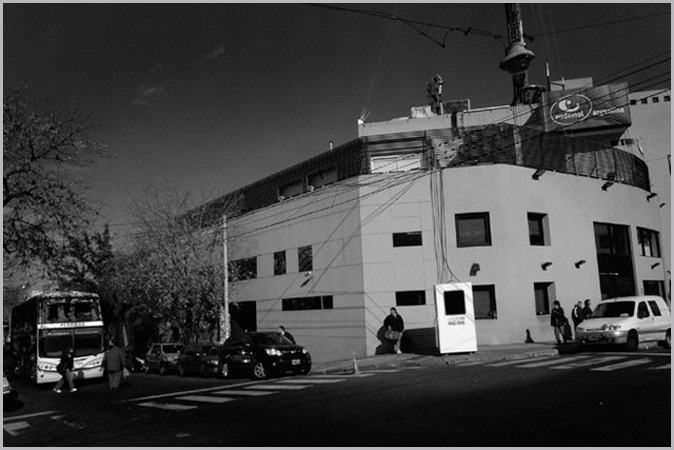 16/22 | Every afternoon, Hugo and his mates trvel by bus to the studio where they film the tv show. 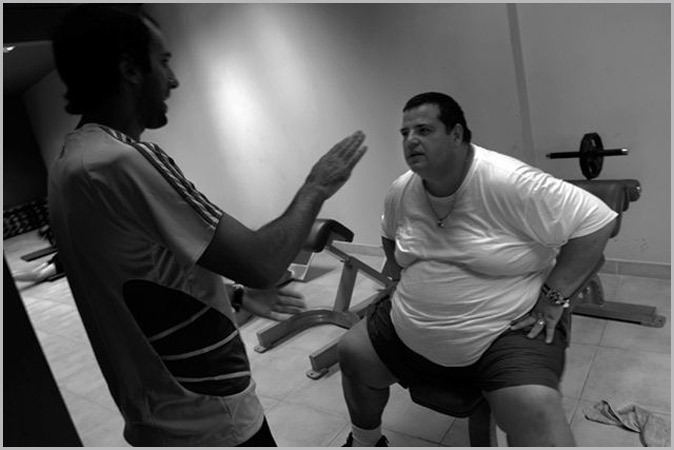 17/22 | His physical instructor gives him directions for the exercises he has to perform. 18/22 | Hugo eating breakfast with his mages before beginning the physical training of the day. 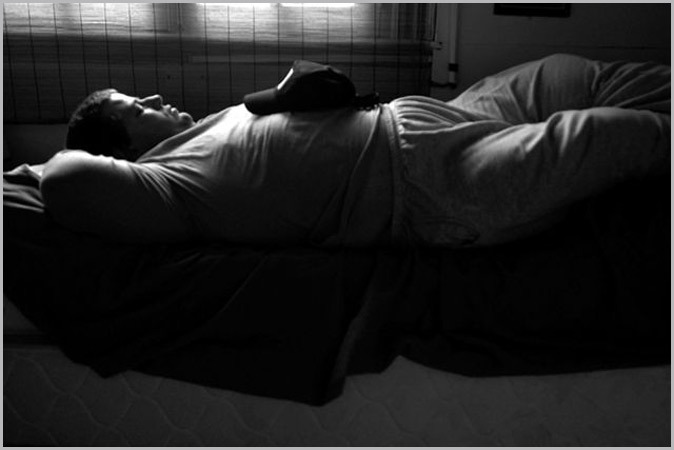 19/22 | Resting in his bedroom. 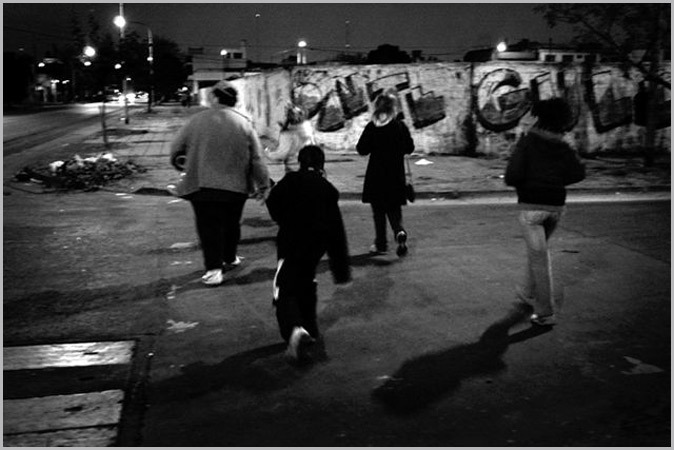 20/22 | Before sunset he takes a stroll with his family around his neighborhood. 21/22 | On the TV set during the shoot. 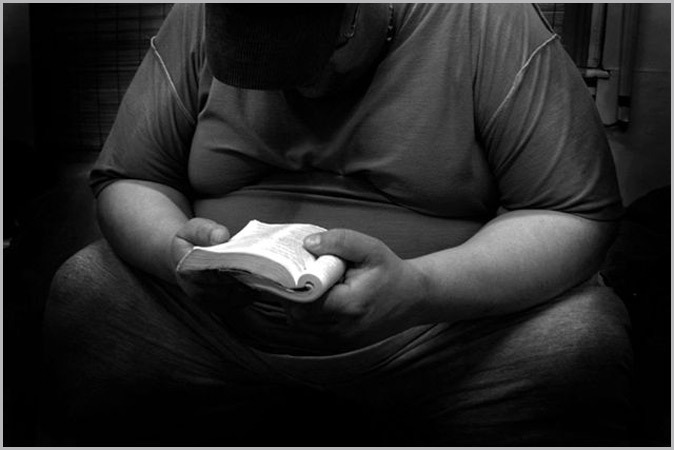 22/22 | When he is very much anguished, he gathers his thoughts by reading the Bible. hola hugo,te conocimos en pinamar compartiendo vacaciones.te felicito! !te deseo buen año y buena vida!!!! que grandes fotografos son felicitadones en ora buena felicidades. Felicitaciones por semejante trabajo. Fotos impactantes que muestran realmente su sufrimiento y lucha. La foto con los hijos en la cama me conmovio. Fotos maravillosas !!! 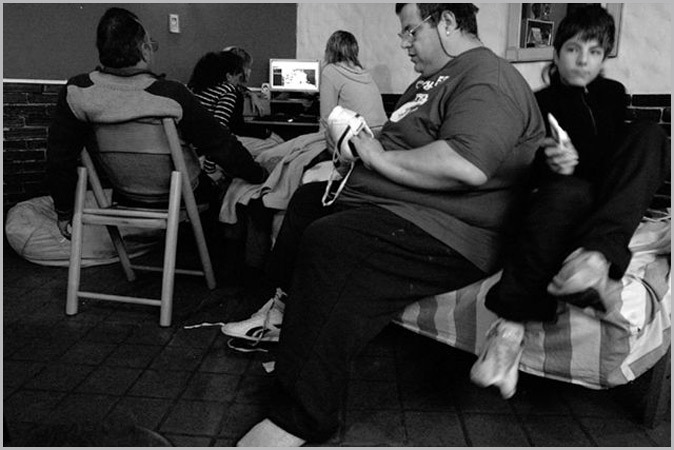 !.La obesidad mórbida es un flagelo que aisla a las personas y niños que la padecen con gran sufrimiento personal y familiar.Ataca a los dos extremos de las clases sociales muy pobres y ricos y nuestros gobiernos deberían tener programas de salud ya que provocan enfermedades cardiovasculares gravísimas. Esta patología va en aumento en los países del primer mundo también. Felicitaciones por mostrar y crear concientización !!! !